If a boldly-styled, beautifully-trimmed, solidly-built, well-equipped and reasonably-priced American mid-size luxury sedan that feels and drives more like a European import would fulfill your needs and desires, the 2011 Lincoln MKZ may be an excellent choice. Lincoln long competed head-to-head with GM's Cadillac at the top of the U.S. market, but has lost a lot of luster in recent years. If brand image ranks higher than comfort, value and substance on your priority list, you may want to look elsewhere. Inside the ultra-quiet, premium-quality cabin are generous portions of real wood, aluminum-look trim and chrome accents. Rear-seat space is surprisingly generous, with more than three feet of legroom. The trunk is a best-in-class 15.8 cubic feet, with a flat floor and low liftover height for easy access, and the compact decklid hinges won't crush or interfere with your cargo. The class-exclusive standard 60/40-split rear seats fold flat, with a convenient pop-down spring assist, for easy storage access or to extend the cargo floor straight through from rear deck to front seats. Lincoln says its modern image target is "earned reward" or "American dream," rather than "old world" flashy or "ostentatious luxury," which translates to quiet, casual, confident and more understated design. With its bold split-wing grille, jewel-like quad projector-beam headlamps, judicious use of chrome trim and low-profile tires on 17-inch, eight-spoke machined aluminum wheels, the 2011 Lincoln MKZ certainly looks the part of a credible mid-size luxury sedan. Around back are large wrap-around taillamps and twin chrome exhausts. The 2011 Lincoln MKZ's specially tuned, fully independent suspension rides a bit softer than the more sport-tuned Ford Fusion's but retains nearly all of the fun-to-drive Fusion's responsiveness and agility. Partly due to the car's stiff structure, its rack-and-pinion steering is precise, with good on-center feel, and transmits little vibration back to the steering wheel, thanks to its mounting on the isolated front subframe. The available "intelligent" all-wheel drive monitors and predicts traction at all four wheels and delivers torque to those with the best grip. The six-speed SelectShift automatic allows the driver to manually shift gears with no forced upshifts and an "enhanced overdrive cancel" mode locks out the fifth and sixth gears permitting shifts at higher speeds for better engine braking. 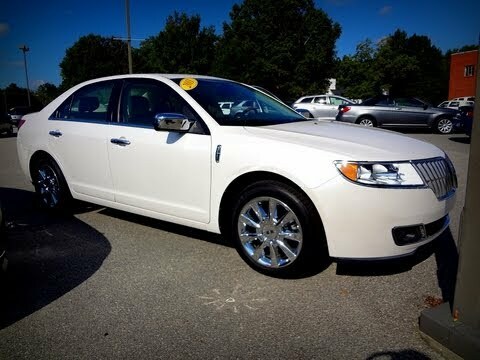 The 2011 Lincoln MKZ's Manufacturer's Suggested Retail Price (MSRP) starts just over $35,000, while the all-wheel-drive model starts around $37,000. A fully-loaded MKZ tops out around $45,000. That's fairly inline with pricing for a comparably equipped Cadillac CTS, Lexus ES 350 and Audi A4. The current Fair Purchase Price on kbb.com will tell you what MKZs are currently selling for in your area. As for resale value, the 2011 Lincoln MKZ's projected five-year residual value falls far short of the values set by the Infiniti G37, Acura TL and Audi A4, and the Cadillac CTS. The nicely-equipped 2011 Lincoln MKZ comes with automatic on/off headlamps, leather seating, heated and cooled 10-way power front seats, tilt/telescoping four-spoke steering wheel with cruise and audio controls, dual-zone climate control, power heated mirrors, power windows and locks, remote keyless entry with exterior keypad, SYNC communications system, AM/FM stereo with six-disc CD changer and auxiliary audio input jack, SIRIUS Satellite Radio and two 12-volt outlets. Standard safety features include AdvanceTrac electronic stability control, Reverse Sensing System, four-wheel anti-lock disc brakes (ABS) with traction control and six air bags: Dual-stage fronts, front seat-mounted side and side-curtain for both seating rows. Among the many MKZ options are chromed wheels, a power moonroof, Adaptive High Intensity Discharge (HID) headlamps, ambient floor lighting, 14-speaker THX II-Certified premium audio with 10 gigabyte Jukebox hard drive and SIRIUS Travel Link, voice activated navigation, rear back up camera, rain sensing wipers, Blind Spot Information System (BLIS) and remote start. Ford has long needed a smoother, more powerful, state-of-the-art V6 for its upscale mid-size entries, and this is it. Along with strong performance, it delivers respectable fuel economy of 18 EPA city miles per gallon and 27 on the highway with two-wheel drive. This 600-watt, 14-speaker system delivers surround-sound worthy of an upscale cinema. An MP3 audio input jack and SIRIUS Satellite Radio are standard. The MKZ's 3.5-liter DOHC 24-valve aluminum Duratec 35 V6 delivers 263 horsepower and 249 pound-feet of torque through a smooth-shifting six-speed, wide-ratio, multiple-clutch automatic transmission. It boasts variable intake-valve timing, a dual-plenum intake manifold and a relatively high 10.3:1 compression ratio to optimize its balance of performance and efficiency. In 2006, Ford introduced its Ford Fusion mid-size sedan and its divisional platform-mates the Mercury Milan and Lincoln Zephyr, all based on Japanese-partner Mazda's well-respected MAZDA6 front-wheel-drive architecture. Building on this proven platform, Lincoln combines the most powerful 3.5-liter V6 Ford engine available (the same used in the Fusion Sport), the six-speed SelectShift automatic transmission and available "intelligent" all-wheel drive to create the mid-size 2011 Lincoln MKZ (pronounced "M-K-Z") luxury sedan. Although the name is confusingly similar to the MKX crossover and new MKS luxury sedan, Lincoln simply follows a long line of luxury manufacturers whose marketers prefer letters and numbers to easily-recognizable names. Comfort and safety as well as performance. I spend a lot of time in the car, and these are the most important things I look for. It is the perfect car for my daily commute. Plenty of legroom and comfortable seating. I drive at least 2 hours a day, and more for my job. I feel safe as my car has been hit twice with minor damage to the car. I live in the Midwest where changing weather conditions are the norm. I have never had a problem with snow or rain. The car now has 140,000 miles and I don't want to replace it. It is the first 6 cylinder car I have owned and can't believe the power it has on the road. My car is a hybrid that regularly gets about 35 miles to the gallon, which means that I spend a lot less time at the gas station. I bought a hybrid vehicle, and that is what I like most about it. I travel about 40+ miles each day and having a hybrid is very handy, mostly because I dislike having to stop for fuel. The vehicle has most of the features that I would want. If I had bought it new, I might have explored blind-spot alert or a rear-view camera display (it does have a rear-view camera, but it only causes a beeping - no computer screen to see behind). The hybrid engine works efficiently and quietly to give you both a quiet and fuel efficient ride. The features of the Lincoln MKZ Hybrid are top of the line. I have been able to get higher than the standard MPG. It has a moonroof, heated and cooled leather seats, back up camera, cruise control, navigation, SiriusXM radio and the back is spacious enough in the back to fit my kids comfortably. It does not waste space; it doesn't feel like driving a boat despite the interior spaciousness.